A Tonk's Tail... err, Tale...: Book review: "Julia's Cats"
We did not know this! It makes the Human like Julia even more than she already does! Last night she was out at a Birfday Pawty at a French Restaurant (of course, *I* was not invited ::pout:: and not kitty bag was brought home for me either), and the group drank a toast to Julia and Helen Gurley Brown, too. We get "not invited" to those kinda restaurants too. That just shows how messed up our humans' priorities are! we have been seeing this and had no idea that Julia Child was a cat lady. how very cool...... mom says she may have to get this book from the library. What an amazing lady! Mommy says she'll take a peek at the local bookstores to see if she can find it. Thanks for the review! I am sooo dying to read this book! Maxwell: *raises paw* I'll take some! 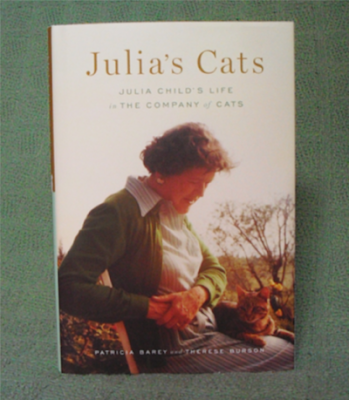 We didn't know Julia Childs was a cat lover! This sounds like a great book! When Mommy was 10, her Mommy was very sick when she was pregnant and Mommy started to cook all the meals. When they gots cable, Mommy used to watch Julia to learn how to cook (her Mommy did not knows how)! Mommy thought Julia was incredible and wanted to be like her when she growed up (but she hated home economics in school) She remembers Julia talking about her cats (only occasionally). mommys says that is why she like Julia better than the Galloping Gourmet! Mowzers, how cool is that!?! Our mom didn't get interested in cooking till she married daddy and he's a food network addict! That is so beautiful, we also didn't realize she was such a cat lover. Dogs: Ugh! Cats??? Not interested. Haopee: I wanted to read the spoiler on the origins of the word restaurant. Sigh! She was a very cool cat lady! Bone appetite!